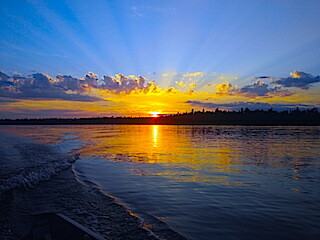 This week was a mixed bag having a few warm days, a few average days but the fish were on catching numbers and size. 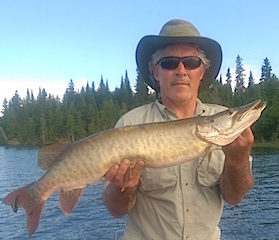 Jeff while Muskie fishing hooked 4 & landed 2 very nice Musky in the mid 30�?� range. 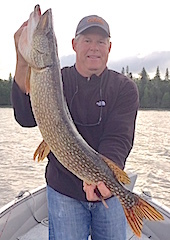 Many of the Pike caught were 30-36�?�, Mike S coming up with the largest at 37.5�?�. 4th & final day was terrific Pike catching day as they said they landed over 50 each making the total over 300 in one day for the group. Returning for his their 2nd time were father & sons Tom, Jim, & Jeff McGlade from Palatine, IL. 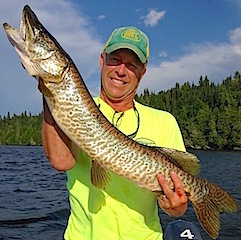 1st day was great catching 34 fish being a mix of Northern Pike & Smallmouth & Jim landed the largest Pike at 34�?� with Tom landing the biggest Smallmouth at 18�?� & 17.5�?�. 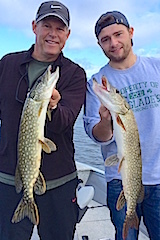 2nd day was even better catching 51 fish mostly Pike 90% being 28-34�?�plus the biggest was Jim�? ?s at 36.5�?�. 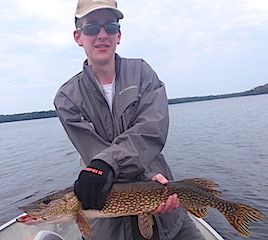 Jeff also lost a big fish & had some large follows & all finised the day with a triple Pike catch on their last cast. It was also a special day being Tom�? ?s birthday, and ended with all three siting on the screened in porch, having great conversation between father & sons, while seeing about 30 shooting stars, That�? ?s a moment for the memory book. 3rd & final day was there best day catching 48 Northern Pike with a lot being 30-35�?�. All left having had a wonderful stay & hope to return in the near future. 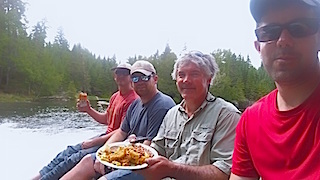 absolutely fabulous as they caught 70-80 Northern Pike while seeing a Bull Moose with a rack partially shedding its velvet. 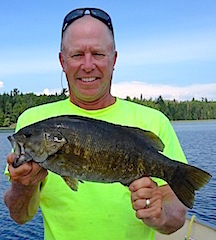 4th day they did well on Smallmouth Bass each landing Trophy Smallmouth Bass over 18�?� plus Ron caught a BIG 39�?� Northern Pike. 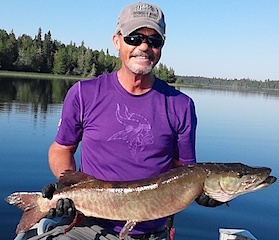 Next day was with focus on Muskie each catching one, Ron�? 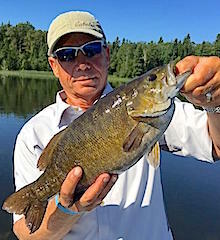 ?s being the largest at 37.5�?�, plus they caught Pike & each landed a trophy Smallmouth Bass. 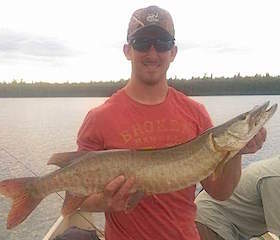 6th day Jake started with a nice Muskie then they caught a bunch of Pike & had follows from the biggest Muskie Ron ever saw. 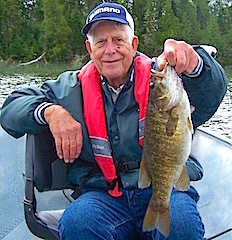 Last day was a good one catching 40+Pike & 20+ Smallies & Ron had Big Daddy or his brother hooked for a only a minute. Both left making a lifetime of memories & Ron intends on returning in 2016 with his wife Lisa. Brothers Bob & John Zukas from Baltimore, MD returned for their 3rd time. 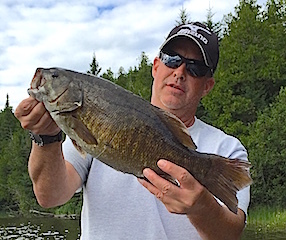 1st day they caught a total of 38 fish, 15 SB with the rest being Pike & John caught 2 Trophy Smallmouth at 18.5 & a GIANT 21�?�er. Unfortunately both had to depart the next day because of an unexpected situation. We very much appreciated them being here & have since been in communication with Bob & both made it home safely. bunch of Pike. 4th day Randy, Dane & Ryan caught 12 Pike 30-35�?� & had 10 follows from big Muskie with John & Greg doing about the same however John saw a fish that Greg lost saying whatever it was it was huge. 5th & final day was another good day catching Pike & Ryan ended their trip with a nice 35�?� Musky on a new lure he bought from my tackle shop. When saying goodbye�? ?s Greg said the countdown has started and is 359 days & counting until their 2017 trip. Tyler Tennant from Lakeway, TX returned for his 13th trip along with brother Warren, from Bellaire, TX for his 2nd visit. 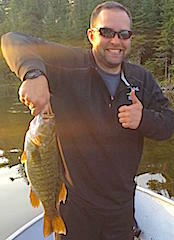 After two days of searching for MR Big on the 3rd day they had fun catching a bunch of Northern Pike & Smallmouth Bass. 4th day these two caught a lot of fish being a mix of NP & SB again but could not hook up with the big fish that were following their lures. 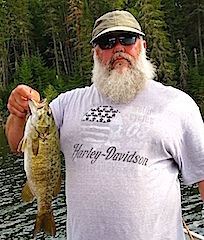 5th day was another good action day on Smallmouth Bass & Northern Pike up to the mid 30�?� range. 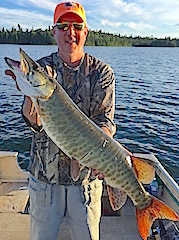 5th day they had a ball catching Many Pike 28 to 35�?�, seeing some huge Muskie. 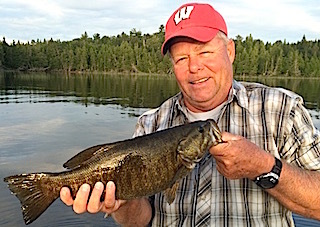 Warren thought it odd spotting two logs under water laying parallel to each other when one started swimming away Warren realized one of the logs was a very large Muskie. Both left having a great time making some new entries to there fishing log for future reference. Long time return guest Leon Robbins was back with his group Andy Thomasson, Justine Sebastian, & Tyler Heath from Yadkinville, Cary, Mt Holly, & New London, NC. 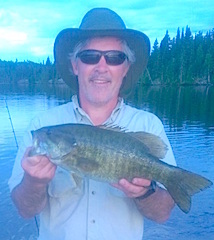 Early morning 1st day Andy caught a huge 19.5�?� trophy Smallmouth. 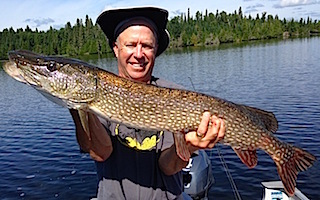 After breakfast they struggled until noon and then started to hit on Pike catching close to 30 per boat. 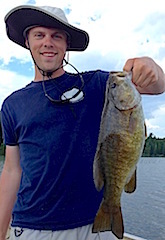 2nd day they focused on Musky fishing doing great catching 5 as a group, Justine, along with landing 3 Muskie caught, a big 35�?� Pike & both Andy & Leon caught Trophy Smallmouth Bass . 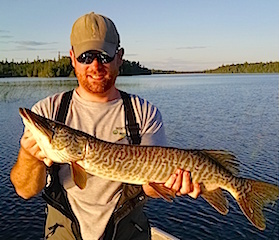 3rd day was all about concentrating on Muskie again & sticking with it proved worthy as they had only 2 hours out of 12 that were active, but caught 8 Muskie during that time. Leon was unstoppable as he landed 6 of the 8. 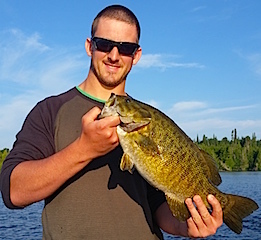 4th day Tyler started with a bang landing a HUGE 20�?� Smallmouth Bass in the morning while the rest of the day was filled with a lot of Northern Pike action. 5th & final day they finished strong catching so many pike the lost count. All left having a great time and hope to return in 2016. The repeat family group of Mike & Dawn Baker Nakoosa, WI, Bill & Jane Pierce and Randy & Nancy Gentz Ellijay, GA, Terry & Jason Baker Oak Creek, WI & Adam Baker Cudahy, Wi were all very happy to be back which was evident from the laughter in the dinning room. which put him in play for the trifecta. 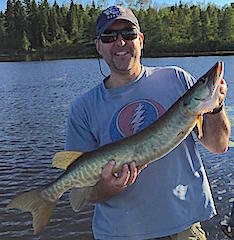 4th day before breakfast Jason caught his 2nd 40�?� Pike in hunt for the trophy Muskie trying to be the 1st to accomplish a trifecta Master Anglers Award for all 3 species. 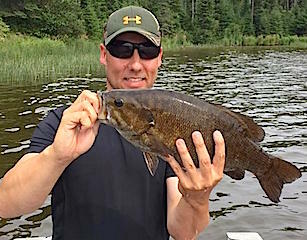 5th & final day was spectacular as a group catching well over 100 Northern Pike & a few Smallmouth Bass including an 18.5�?� for both Terry & Jason. All left having had a wonderful family fishing vacation & hope to do it all over again in 2017. Friends Bill Winland & Gerry Kleinhenz from Massillon & Del Roy, OH were first time guests. 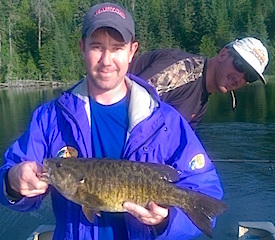 1st day these two caught over 20+ Pike and 6 Smallmouth Bass with Gerry catching a Big Trophy size Smallmouth. 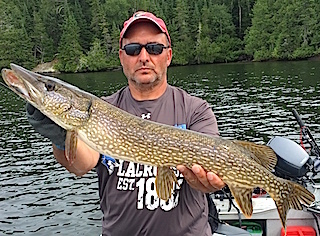 2nd day they were in search of Muskie having some great Musky follows but could not hook up on one, however they did catch some nice Pike. 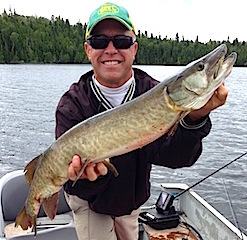 Day 3 was great catching Pike in pursuit of a Musky & Billy found one. 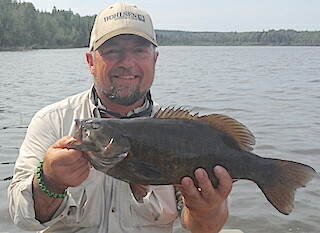 After a good fight & having it netted the fish thrashed and got out of the net leaving his lure behind. This was Billy�? 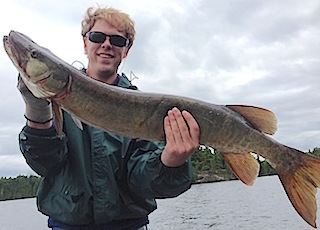 ?s 1st Musky catch going about 36�?�. 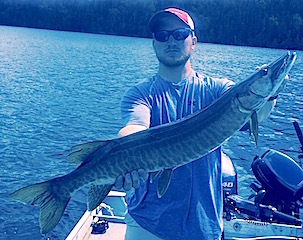 4th & final day was all about Musky again seeing lots of follows, some very big, & Billy ended up catching 2, largest being 35�?�. Both had a great time & Billy hopes to return with his wife in 2016. Back were David Henry & son Jacob St Charles, IL 4th time, Bob Mezo Dixon, IL 3rd time, & Tom Traveny Hershy, PA. 2nd time. 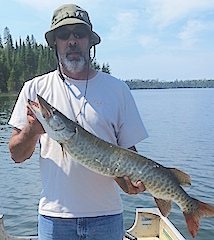 DOA all had some Musky follows, caught Pike & SB & Tim set the BIG FISH bar by landing a 35�?� Muskie & Northern Pike. 1st day was a �? 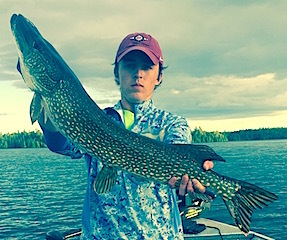 ?WOW Day�?� as a group landing 92 Northern Pike. 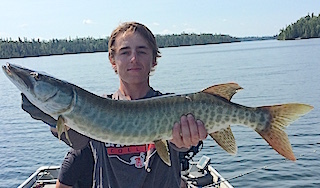 2nd day they were in search for Muskie which was a success as Tim caught a big Tiger Muskie, Dave landing a 33�?� and Jacob caught 2 Musky. That�? 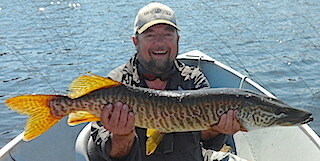 ?s 5 Muskie for this group in 2 days. 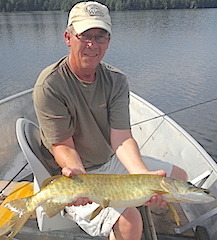 3rd & final day had them catching 50+ Pike & Bob caught his 1st ever Musky. All left having had a ball & are already planning a return trip.